Biostar N4SLIA9T T-Force4 SLI Socket 939 ATX motherboard is for AMD Athlon 64 FX, AMD Athlon 64 X2, AMD Athlon or AMD 64 Sempron socket 939 CPU processor. It features NVIDIA nForce4 SLI chipset and supports Hyper Transport technology up to 2000MHz full duplex, AMD Cool’nQuiet technology and 4 Dual Channel DDR 333/400 MHz DIMM memory slots for up to 4GB memory in ATX form factor. 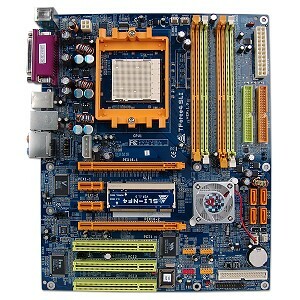 The motherboard also has 2 PCI-Express x16 slots which supports SLI x8 mode, 2 PCI Express x1 slot, 3 PCI slots, 4 Serial ATA (SATA) 3Gb/s connectors to support up to four SATA2 drives with NVIDIA RAID Technology and SATA RAID 0, 1, 0+1, Gigabit Ethernet (1000BaseT) jack, plus other standard I/O connectors. N4SLIA9T also has integrated Realtek ALC850 8 Channel Audio Codec and BIOS that features ONE (Overclocking Navigator Engine), CRP (CMOS Reloading Program), SRS (Self Recovery System), MIT (Memory Integration Test) and IFP (Integrated Flash Program).